A brick and stucco exterior with hip roof and columns give this traditional home dignity and grace. The formal dining room, distinguished by a tray ceiling and a box bay window, is open to the kitchen for easy service and clean up. The great room features a cathedral ceiling for a feeling of spaciousness, as does the front bedroom/study. The master bedroom is very generous for a home this size, with an extravagant private bath and a large walk-in closet. Utility and linen closets are conveniently located in the bedroom wing of the house. 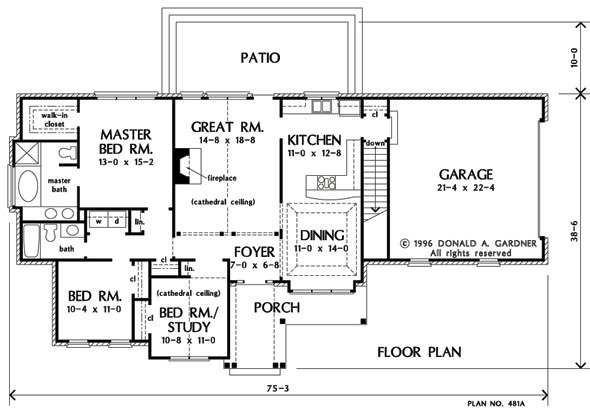 1st Floor: 1538 Sq. 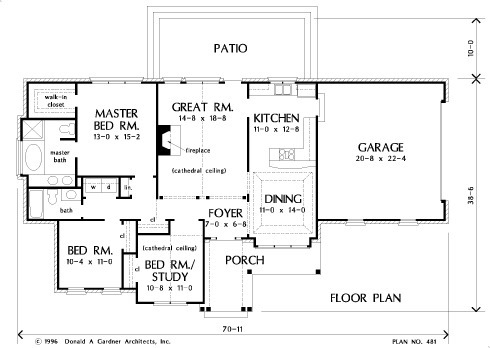 Ft.
House Dimensions: 70' 11" x 38' 6"
Great Room: 14' 8" x 18' 8"
Master Bedroom: 13' 0" x 15' 2"
Foyer (Vaulted): 7' 0" x 6' 8" x 10' 4"
Dining Room (Tray): 11' 0" x 14' 0" x 10' 4"
Great Room (Cathedral): 14' 8" x 18' 8" x 17' 0"
Kitchen : 11' 0" x 12' 8" x 8' 0"
Utility Room : 5' 10" x 3' 2" x 8' 0"
Garage : 20' 8" x 22' 4" x 0' 0"
Master Bedroom : 13' 0" x 15' 2" x 8' 0"
Bedroom / Study (Cathedral): 10' 8" x 11' 0" x 14' 4"
Porch - Front : 8' 3" x 11' 6" x 0' 0"
Deck / Patio : 24' 0" x 10' 0" x 0' 0"